uuid : 584206bc-dd38-4253-961c-35327fe17d86 templates_id: 119455 templates_uuid: "39f5c230-710c-4bbe-97a6-7f7210f9d3c8" title: "Will Template - Free Last Will & Testament Form Online" display_name: "Last will and testament" meta_keywords: "Will" description: "
Put your mind at ease with this straightforward last will and testament that will name executors to make sure everything is properly dealt with and appoint guardians to take care of your children. Making a will can be a difficult process but it will give you peace of mind that everything will be taken care of according to your wishes should the worst happen. This last will and testament covers appointing executors, guardians for your children, legacies and what will happen to the rest of your estate. A will sets out how someone\302\222s estate - which includes property, savings and other assets - should be distributed after their death. It\302\222s essentially a written set of instructions which specifies the beneficiaries who will inherit the estate of the deceased, and the executors who will ensure that assets are distributed according to the wishes contained in the will. Without a legally valid will, your estate will be distributed according to the \302\223rules of intestacy\302\224 - an old fashioned set of instructions which specify a strict order of beneficiaries; primarily married or civil partners and close relatives. If you lived with a partner for many years but were not married or in a civil partnership, without a will they may not stand to inherit anything if you die intestate (without making a will). So it\302\222s important to make a will to ensure that you have a say in what happens to your estate after your death. Why do I need the fact that I am getting married to be noted in my will? In general, any will that you made before getting married to a new partner will be revoked upon marriage and therefore be invalid. However, there is an exception to this rule: if your will states that you are about to get married and confirms that you intend the will to remain valid after marriage, it will not be revoked. Do I need to specify a guardian in my will if I have children? If you have any children under the age of 18, you may want to consider appointing testamentary guardians in your will. Guardians take over parental responsibility for your children, which means they need to look after your children as well as take decisions about things like their education or religious upbringing. Can I leave gifts of money or specific items using a will? Yes. You will can go into as much or little detail as you choose. You can specify that certain assets are given to individuals (eg. your house is inherited by your daughter and your car by your nephew, or that your savings are divided equally between your children, wife and a charity). What is the remainder of the estate? The remainder or residue of your estate refers to what is left of your estate following the distribution of specific gifts and deduction of debts, taxes and other expenses. If you have not made any specific gifts, the residue will make up your entire estate (after debts, taxes and expenses). Can I include funeral or burial wishes in a will? You can state funeral arrangements in your will (eg. whether you would like to be buried or cremated) - but it\302\222s important to note that these wishes are not legally binding. It is nevertheless useful to express these wishes in your will - but normally your relatives will decide on funeral arrangements, and executors have the ultimate say. What is the difference between an executor and a witness? Your will should name one or more executors (often family members or close friends), who will be tasked with carrying out your instructions and distributing your estate according to the will. An executor can also be a beneficiary. 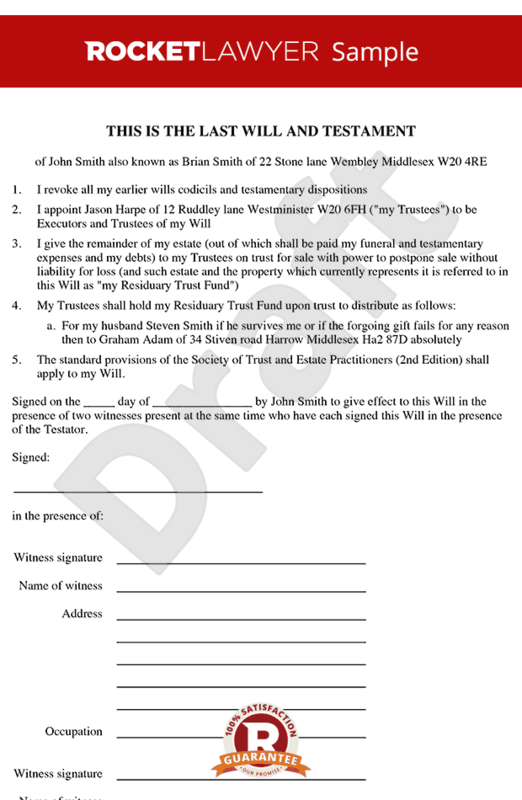 The signature of wills must be witnessed by at least two people who will not benefit under the will (either directly or via their married or civil partners). A witness can also be an executor, as long as they (or their wife or civil partner) are not named as a beneficiary. Is it necessary to use a solicitor to make a legally binding will? You do not need a lawyer to prepare a legally binding will. As long as you are of sound mind and not being unduly influenced when you make your will, state how you wish your estate to be distributed upon your death, name the beneficiaries and executors, and sign your will in the presence of witnesses, it should normally be legally valid. However, if you have a more complex estate, it will often be advisable to Ask a Lawyer to check things over. How do I change a will? In order to make a minor change to a will (such as changing the name of an executor), you can use a document called a codicil, which needs to be witnessed in the same way as when making will. If you are making more substantial changes, you should consider make a brand new will, which states that your previous wills are revoked.
" created_timestamp: "2018-10-08 04:36:00.0" modified_timestamp: "2018-10-08 04:36:00.0" active: true created_by: 104 modified_by: 104 dcm_id: 170 url_slug: "Will" meta_description: "Create a free Will using our step-by-step interview. Make your Last Will & Testament online today. Use our free Will template to protect your family. " time_to_complete: "20 minutes" role1: "Testator" role2: "Beneficiary"
A will sets out how someones estate - which includes property, savings and other assets - should be distributed after their death. Its essentially a written set of instructions which specifies the beneficiaries who will inherit the estate of the deceased, and the executors who will ensure that assets are distributed according to the wishes contained in the will. Without a legally valid will, your estate will be distributed according to the rules of intestacy - an old fashioned set of instructions which specify a strict order of beneficiaries; primarily married or civil partners and close relatives. If you lived with a partner for many years but were not married or in a civil partnership, without a will they may not stand to inherit anything if you die intestate (without making a will). So its important to make a will to ensure that you have a say in what happens to your estate after your death. You can state funeral arrangements in your will (eg. whether you would like to be buried or cremated) - but its important to note that these wishes are not legally binding. It is nevertheless useful to express these wishes in your will - but normally your relatives will decide on funeral arrangements, and executors have the ultimate say. More than just a Last will and testament template, our step-by-step interview and guidance makes it easy to create your document. Easily create online, download, print and sign your free Last will and testament in minutes. This document is also sometimes called: Will.